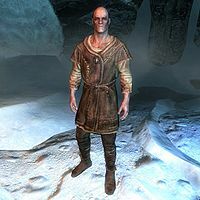 Gestur Rockbreaker is a Nord miner working in Rockwallow Mine in Stonehills. He wears a belted tunic and a pair of boots, and defends himself with an iron dagger. He also carries a selection of common loot and gold. Gestur will buy any iron ore you have for 7 gold each. Gestur sleeps at the miner camp from 1am to 6am, when he wakes up, he immediately goes to work in the mine for a grand 15 hours before returning to wander around the camp before his usual bedtime. If spoken to, he may tell you about the mine and the owner: "If you're here about the mine -- it's already got an owner, and she's not selling. If not, then please stay out of my workers' way." or "Bryling owns this mine. I wouldn't have much to live for if she hadn't offered me a job." He may also comment on his job: "I spend every waking moment making sure the mine is put to good use. ", "My job is my life. Whatever happened before doesn't matter." or "You get used to the cold after a while. The harder you work, the warmer you stay." Jesper: "Yes sir, fine sir." Gestur: "Good, good. Keep up the hard work. It'll all pay off." Gestur: "Is everything well with you, my scaly friend?" Teeba-Ei: "Teeba-Ei is cold, but Teeba-Ei works hard as always." Gestur: "Yes, well... That's all we ask of you. Carry on." Gestur was supposed to have a house located at Stonehills, the related key and locklist still exist but go unused in the final game. This page was last modified on 5 April 2018, at 00:02.